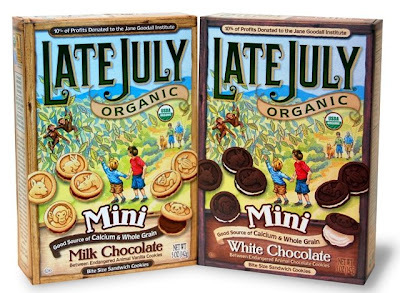 Oh, I am thrilled to tell you all about Late July Organic Snacks and their new organic mini cookies! They are so delicious!! They are so generously donating 10% of the proceeds of these cookies to the Jane Goodall Institute. I had no reservations feeding Late July's cookies to Dexter not only because they have fun animals on each cookie (or cracker is what I told Dexter they were) but because they are a good Source of Whole Grains (8g per serving), good Source of Calcium (10% DV), they are organic and they have the "Good For All" Seal - Dr. Jane Goodall's seal for ethically produced products! Next time you are looking for a fun treat for your little ones, don't hesitate to buy Late July, they will be glad you did! We tried the Late July organic crackers (kinda like Ritz) and they were good. My son really liked those! These look yummy! Did you find them locally? ?